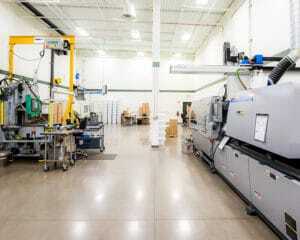 Diversified Plastics expands with environmentally controlled, molding room Diversified Plastics, Inc.
To meet growing demand, Diversified Plastics, Inc. has enlarged its molding and packaging, environmentally controlled, room by 2,775 square feet (257.81 square meters). The company has also installed a new 250-ton molding machine that accommodates existing molds and increases capacity and flexibility in scheduling. In addition to this controlled environment, Diversified Plastics has two clean rooms and an environmentally controlled assembly room. Less stringent than a clean room, controlled environments are pressurized, isolated manufacturing spaces with positive airflow as well as temperature and humidity controls. The plastic resin is located outside the room and is piped into the press, keeping dust under control. Employees wear gowns, sterilized shoes and, when required, gloves. Special mats on the floor reduce dirt coming into the room.